And then there were two. 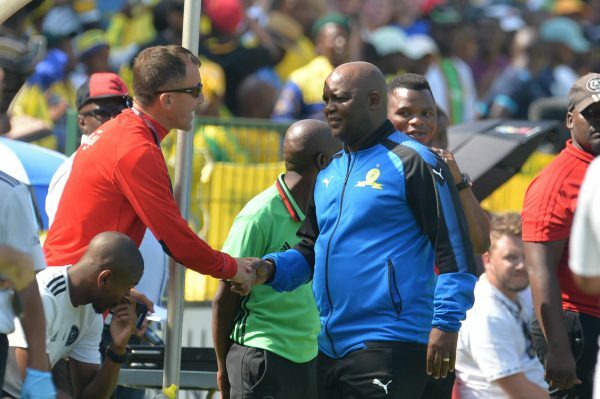 Mamelodi Sundowns and Orlando Pirates are now officially the only sides that can win this season’s Absa Premiership, with the Buccaneers’ victory at AmaZulu on Sunday at least keeping some sort of pressure on Pitso Mosimane’s Masandawana. Sundowns are still heavy favourites, of course, to lift a third championship in five seasons, and even more so if they can stretch their lead to six points, with three games left to play, at home to Golden Arrows this evening. Sundowns have all the pedigree to complete the job, and while a victory for Arrows would serve the interest of a neutral wanting an exciting title race, as well as any Buccaneer, it is unlikely to happen. Pirates are, however, to be commended for pushing Sundowns all the way in 2018, a side revived under the wise guidance of Milutin Sredojevic and Rulani Mokwena. Even if the Buccaneers ultimately fall short, Sundowns will at least have been pushed to take their place at the top, not handed it on a silver platter. The same accolade of proper challenger cannot be given to Kaizer Chiefs, despite protestations from some at Naturena that they were still in the running until the final dying bleep from the calculator of permutations. Amakhosi, under Steve Komphela, have been too limp to mount a concerted shot at the title for three seasons now. Some Chiefs fans lost their cool after the 3-0 defeat to Chippa United on April 7, and even if Chiefs win the Nedbank Cup, there is still a decent argument for Komphela’s contract not being renewed once the campaign is over. Not that Komphela is entirely to blame, with Chiefs’ management too often in the last three seasons either unable or unwilling to keep pace with Sundowns in the transfer market. The difference in overall quality between the Chiefs squad and the Sundowns squad right now is simply terrifying. Sundowns, meanwhile, could well be the only side left in continental club competition this season, if SuperSport United and Bidvest Wits cannot complete tricky tasks in the Caf Confederation Cup this week. SuperSport must overturn a 1-0 deficit to Gor Mahia of Kenya, which may not be too much of a problem, but for the fact that Kaitano Tembo’s side are currently facing a place in the relegation play-offs if they cannot get their act together in the last three league games of the campaign. One suspects that SuperSport’s management would take an exit from a continental competition that clearly took it out of the players en route to last year’s final, if survival in the Absa Premiership was guaranteed. As for Wits, they could really do with getting past Enyimba in Calabar, Nigeria this week, if only to jab back at the naysayers who claim they do not take Caf competitions seriously enough. Wits have been a bit unlucky in Africa over the last couple of years, just losing out to the might of Al-Ahly in the Champions League 2017, while this year the lottery of penalties did for them against Primeiro de Agosto of Angola. One would think, however, that dropping down a level into the Confederation Cup would produce better results from Gavin Hunt’s men than another early exit before the group stages.